All public and municipal spaces (parks, gardens, buildings, sidewalks) are the focus of the Public Properties Committee. This group first started by taking a detailed audit of all public spaces in Kenmore and now observe these spaces continually to ensure that they continue to improve in visual and functional appeal. You are very welcome to join this Committee of big hearted people who care so much for the public spaces in our community. Public Properties Committee meets on the 2nd Monday of every month at 7 pm and at other times as needed. Jennifer and Brian both grew up in Western New York and enjoy traveling, hiking and skiing together. Jennifer is a biologist, birdwatcher, and “foodie,” and Brian is a systems administrator who enjoys playing hockey and soccer. Jennifer and Brian moved to Kenmore in 2016. They recognized what Kenmore had to offer – a cozy community feel with gardens, seasonal events, and decorations, paired with proximity to restaurants, stores, bike paths and parks. 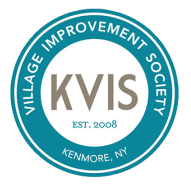 Once they arrived it was only natural to join the Kenmore Village Improvement Society to support the heart of their new neighborhood. Linda Schoemich met her husband Jerry when they were just 13 and 15 years old. Linda was a Geriatric Nurse Practitioner who loved the Kenmore Village home she shared with Jerry for 43 years...and she loved the plant Lilly of the Valley. Those who love Linda and her family made a kind and generous donation to the KVIS in memory of this extraordinary woman. Our Green Thumb Helpers volunteers have her favorite plant in the Delaware Avenue garden next to Best of Health. Linda gave so many gifts of beauty throughout her life—the scent and loveliness of these flowers is now a continuation of these gifts for all to enjoy.